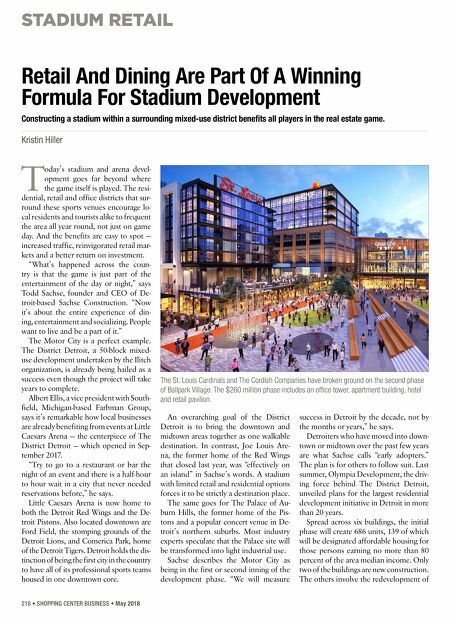 STADIUM RETAIL 218 • SHOPPING CENTER BUSINESS • May 2018 T oday's stadium and arena devel- opment goes far beyond where the game itself is played. The resi- dential, retail and office districts that sur- round these sports venues encourage lo- cal residents and tourists alike to frequent the area all year round, not just on game day. And the benefits are easy to spot — increased traffic, reinvigorated retail mar- kets and a better return on investment. "What's happened across the coun- try is that the game is just part of the entertainment of the day or night," says Todd Sachse, founder and CEO of De- troit-based Sachse Construction. "Now it's about the entire experience of din- ing, entertainment and socializing. People want to live and be a part of it." The Motor City is a perfect example. The District Detroit, a 50-block mixed- use development undertaken by the Ilitch organization, is already being hailed as a success even though the project will take years to complete. Albert Ellis, a vice president with South- field, Michigan-based Farbman Group, says it's remarkable how local businesses are already benefiting from events at Little Caesars Arena — the centerpiece of The District Detroit — which opened in Sep- tember 2017. "Try to go to a restaurant or bar the night of an event and there is a half-hour to hour wait in a city that never needed reservations before," he says. Little Caesars Arena is now home to both the Detroit Red Wings and the De- troit Pistons. Also located downtown are Ford Field, the stomping grounds of the Detroit Lions, and Comerica Park, home of the Detroit Tigers. Detroit holds the dis- tinction of being the first city in the country to have all of its professional sports teams housed in one downtown core. An overarching goal of the District Detroit is to bring the downtown and midtown areas together as one walkable destination. In contrast, Joe Louis Are- na, the former home of the Red Wings that closed last year, was "effectively on an island" in Sachse's words. A stadium with limited retail and residential options forces it to be strictly a destination place. The same goes for The Palace of Au- burn Hills, the former home of the Pis- tons and a popular concert venue in De- troit's northern suburbs. Most industry experts speculate that the Palace site will be transformed into light industrial use. Sachse describes the Motor City as being in the first or second inning of the development phase. "We will measure success in Detroit by the decade, not by the months or years," he says. Detroiters who have moved into down- town or midtown over the past few years are what Sachse calls "early adopters." The plan is for others to follow suit. Last summer, Olympia Development, the driv- ing force behind The District Detroit, unveiled plans for the largest residential development initiative in Detroit in more than 20 years. Spread across six buildings, the initial phase will create 686 units, 139 of which will be designated affordable housing for those persons earning no more than 80 percent of the area median income. Only two of the buildings are new construction. 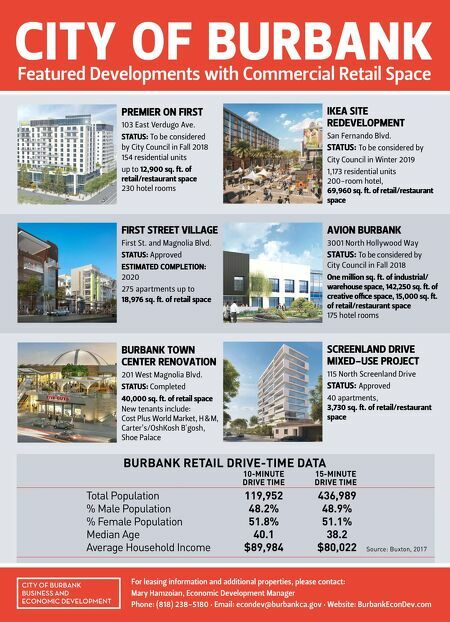 The others involve the redevelopment of Retail And Dining Are Part Of A Winning Formula For Stadium Development Constructing a stadium within a surrounding mixed-use district benefits all players in the real estate game. Kristin Hiller The St. Louis Cardinals and The Cordish Companies have broken ground on the second phase of Ballpark Village. The $260 million phase includes an office tower, apartment building, hotel and retail pavilion.